Ok, I’ll admit this isn’t my usual type of read at all – despite my fondness for The Secret of Nimh (the first movie I can remember seeing in the movie theater). Real rats are icky. But these aren’t ordinary rats - they’re more like humans with rat bodies (think Ratatouille). 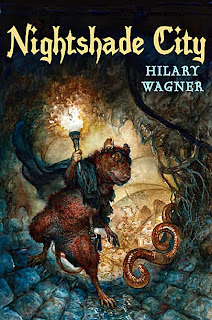 I was quickly drawn into the story, which involves some noble rats – Juniper, his niece Clover, the orphaned Nightshade brothers, and the awesomesauce Mother Gallo – plotting to overthrow the decadent Killdeer, sadistic Billycan, and the Kill Army they’ve amassed. There are daring rescues, nighttime escapades, long-lost loves and more. None of it is too explicit (this is middle grade after all), but it is fun. I especially liked how Wagner integrated the humans and the earthworms into the story. I think I might have enjoyed Billycan’s character the most – he’s evil, but he owns it. And he can blame it on his terrible past as a lab rat. OK – so I wasn’t pleased about his cat-killing ways, but he is mutant rat after all, so as long as he stays away from my kitties, I’ll try not to hold a grudge. The only thing that took me out of the story somewhat was the constant description of each and every rat’s fur and markings. I have no problem getting the 411 on the main characters’ appearances, but do I really need to know that some random rat is a gorgeous shade of licorice? (No, I don’t). NIGHTSHADE CITY is available now in hardcover. And lucky for me, I hear there’s a sequel in the works all about Billycan! For more information about the book, visit the author’s blog. I am really not fond of rats either, but you make this book sound fascinating. My son is reading a book about sentient rats right now too, but I can't remember the name of the book, only that it has the word cat in the title. I bet he and my daughter would love this book, so I will be looking for it for them. Also, so glad to hear that you will be able to read more about Billycan in the near future! 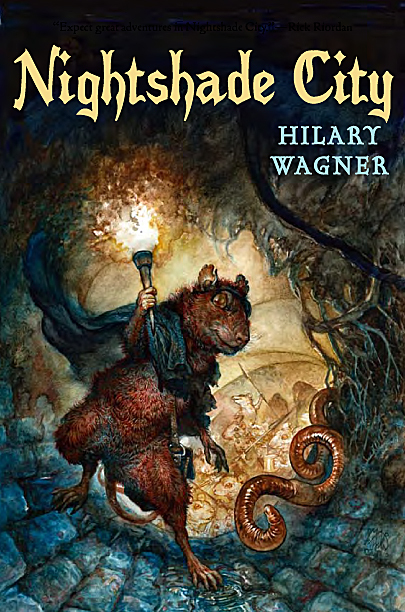 I actually really want to read this because it kind of reminds me of Redwall, what with the rats and mice, etc. And yes, I love Redwall, hard. April - My goddaughter loves the Redwall series! This sounds like a book that would be very popular with the middle school set! This sounds kind of cool. I like books like Redwall, Watership Down, Nimh that play with sentient animals.